Diamondback Media Day Contest Winner! Scott And Carol Present: PPP With A Twist! 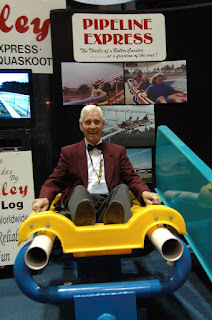 Another Log Flume Bites The Dust? 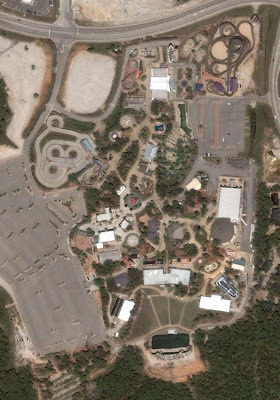 Dixie Landin' / Blue Bayou Expanding? 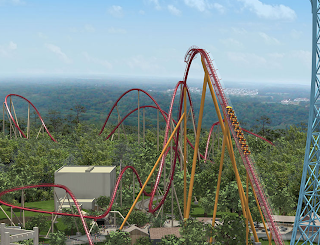 I read that Kings Dominion had officially announced the addition of two new rides to the park for 2009, but didn't actually see a release anywhere! 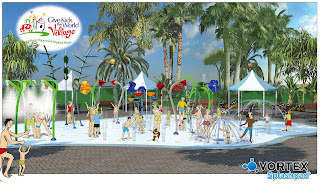 Thankfully for the park they have KD Fansite to keep up with their news, as the site has published the official release detailing the addition of the new attractions. 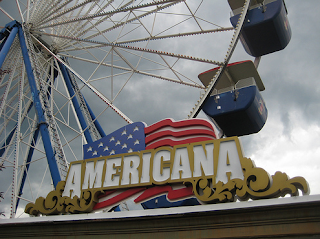 Both the Americana ferris wheel and El Dorado spinning ride will be added to the park near the Hurler and Rebel Yell wooden coasters. Both rides were formerly located at Geauga Lake. 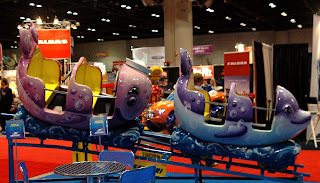 The Black Squid flat ride was also moved to the park but will not be added. 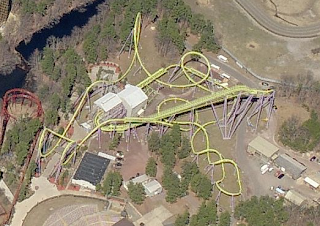 Check out Flyin' Phil's brand spanking new aerial photos of Medusa at Six Flags Great Adventure's new paint job. The track is a sweet looking dark blue, and the supports do not look like they have been touched yet. At this time, no one seems sure if the supports will be a totally different color or if they will remain purple. I like it so far! The picture here is for comparison, it's quite a difference! Sadly now just a piece of history, here's an aerial I stitched together of Celebration City theme park located in Branson, Missouri. I really hope something good comes for the GCI wooden coaster, the Ozark Wildcat. 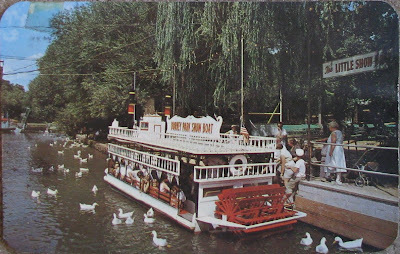 "Famous Showboat surrounded by Pekin ducks in the stream at the entrance to Dorney Park." 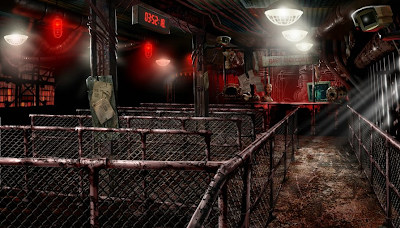 Thorpe Park Mania has published some new concept renderings of the inside of Saw The Ride's main building, specifically the station area (seen above). 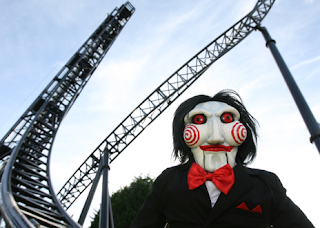 The 100 ft. tall custom designed Gerstlauer EuroFighter coaster is themed to the Saw movie franchise. There are other themed elements that will take place inside the main building before the ride heads outside, but for now those sections remain a secret. Between the unique ride theming and awesome track design, this is going to be on heck of a ride! The GCI Intern website has updated their photos of the construction of their new wooden roller coaster at Forellenhof in Germany. The mid-size wooden ride looks to be quite a twisted mess of track, and I love it! 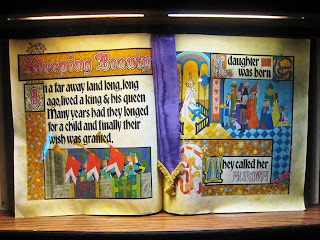 Beautiful is what the newly reopened inside walkthrough tour of Sleeping Beauty's Castle at Disneyland is! The classic attraction has been greatly improved from it's former version, no longer is it just dioramas and the story to read, now there are many new effects, audio, and lightning that enhance the experience. Reading the description and checking out all the fantastic photos posted in this thread at MiceChat will really show you what I mean! Happy Thanksgiving to all our NewsPlusNotes readers! We hope you all eat and be merry, and also remember to gives thanks for all the wonderful things we have in this world - everything from our loved ones to roller coasters! Universal Studios Florida has kicked the construction for Rockit into high gear, as seen in these photos posted to ThemeParkReview. Many parts of the park have been torn up, and it appears as steel has gone vertical for the new stage that will be part of the project. I'm sure the coaster will follow soon behind! Track works looks almost complete on Europa Park's new coaster for this coming year. The park also appears to be following through with their arctic theming on the ride, as major fake rockwork is going on underneath the ride. EPFans has some very recent photos for you to check out at this link. KICentral.com has another round of photos of Diamondback at Kings Island taken from a plane. These new views show that work has started on the ride's second hill, and they also give another perspective of the completed lift and drop. 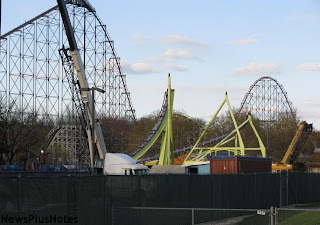 Worlds of Fun has posted new photos of Prowler's construction as well. "Bent zero" was recently placed, which is the tallest and biggest on the ride - so basically the ride has been topped off. 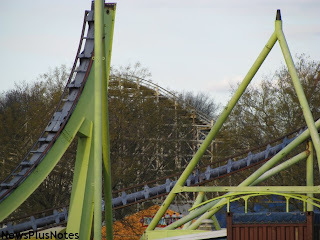 There's also some great new shots of the ride's first drop from different angles. 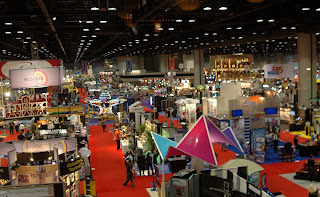 The Themed Entertainment Association recently revealed the winners of the 15th annual TEA Awards at the IAAPA show. The awards represent the best of the best when it comes to immersive, themed attractions found around the world. EPCOT Center at Walt Disney World also received this year's Classic Award. Full results on TEA's blog. Wild Adventures Theme Park, now under the ownership of Herschend Family Entertainment company, is greatly expanding their Holiday event this year, aptly called Festival of Lights. The park will have more than a million lights up, and special entertainment as well as the park's other rides and attractions. Dorney Park certainly gets its share of NPN love. But what about its competition down the road? Let's see what the "Sweetest Place on Earth" had to offer us back in 1999. Note the now vintage pinwheel logo. Gotta love it! 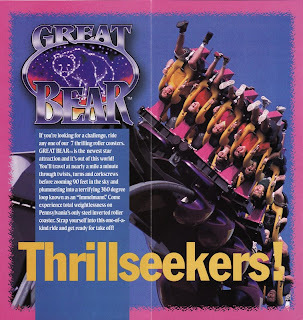 Great Bear, in only its second season at the park, landed the much coveted brochure cover spot in '99. 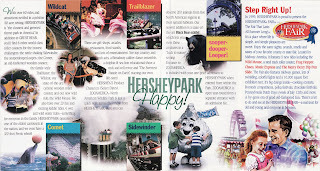 The year 1999 saw the introduction of the Hersheypark Fair, which gave a whole new flavor to the relatively new Midway America area of park. 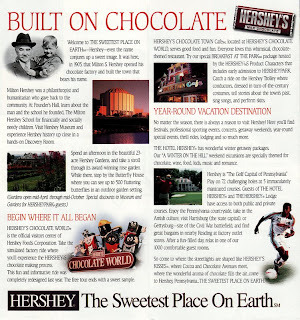 While the nostalgia of Midway America is still alive and well at Hershey, I daresay this area of the park has been overshadowed--not to mention isolated--by the introduction and continuing expansion of The Boardwalk. Such is the delicate balancing act that faces older, space-challenged parks. We can only hope that the balance swings in the other direction once in a while! 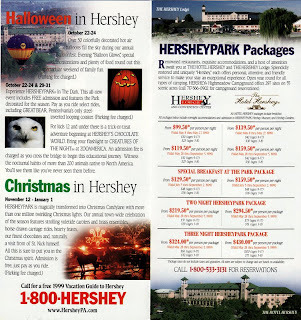 Hershey, PA truly is a vacation destination. While most of us industry junkies tend to focus on the park, there are many other diversions to be found in this area. It's no wonder the park is always so crowded! While Christmas Candylane was a well established event by this point in time, the park was just beginning to dip its toes into the Halloween market. And I'm sure we are all thankful that they did! Ah, Christmas Candylane... One NPN writer--can't imagine who--will be hitting up the 2008 rendition of this event in just a couple short weeks. Stay tuned for full coverage! Well, that about wraps up this week's brochure spotlight. 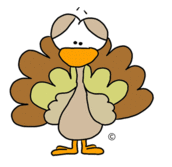 And before we get ahead of ourselves with the Christmas Candylane business, I'd like to wish all of you in the States a very happy and restful Thanksgiving! Heck, I wish those of you NOT in the States the same! I'm sure we all have many reasons to be thankful, and who needs an official national holiday to celebrate that? 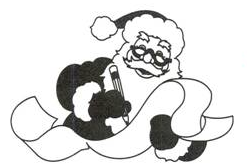 For decades now the Santa Claus Museum along with Santa's Elves Inc. have utilized their task force of Elves to answer letters written to Santa Claus and mailed to the main man at home in Santa Claus, Indiana. This holiday tradition has grown over the years, and the numbers of letters each year has grown as well. This year, however, word of the letter answering service has spread via the internet and poor Santa Claus is feeling a little overwhelmed it seems! Patricia Koch, of Holiday Word fame, says "Short and simple, we need more Elves. We need dozens of kind-hearted volunteers with legible handwriting and a belief in Santa to help respond to the letters. The Elves simply read the children’s letters and then, on behalf of Santa, add the child’s name plus a personal “P.S.” to the colorful letters which Santa has already written by hand." Those interested in volunteering to be Santa’s Elves are asked to call the Santa Claus Museum at 812-937-2687 or email scmcurator@psci.net for more information. The Museum is open Mondays through Saturdays from 8 am to 5 pm CST. Evening and Sunday hours may be arranged as well. The letters, envelopes, red pens, and stamps are all provided at the Museum, along with the good cheer of fellow Elves. As is the tradition, there is no charge for the letters. This is a wonderful tradition that as Mrs. Koch says, "This is a simple, sweet way to help a child believe in the magic of Santa and the spirit of giving." 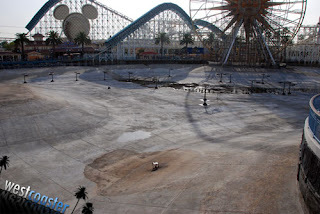 How weird does the Paradise Pier section of Disney's California Adventure look now that it has been fully drained? It looks like a skate boarder's paradise. Westcoaster has a full Disneyland and Disney's California Adventure update with many more photos like the one above. Here is a link to Westcoaster's full update. I just don't see what looks fun about this! No wonder only 3 were built. KINGS ISLAND, Ohio – Rick Lynch works on a new entrance sign for The Beast roller coaster at Kings Island. 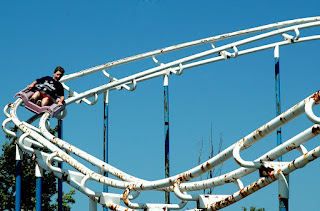 In 2009, The Beast celebrates its 30th anniversary of thrills. When the Beast opened April 14, 1979, it was acclaimed America’s ultimate roller coaster. It broke all existing records as the longest and fastest ride in the world. It is still listed in the "Guinness Book of World Records" as the longest wooden roller coaster anywhere. It's a very special day for NewsPlusNotes! 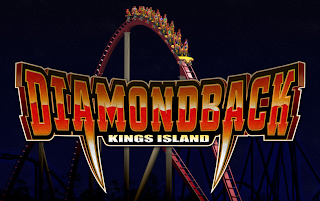 Today is our 2nd anniversary and the day we announce our Diamondback at Kings Island Media Day Contest winner! Before the winner - I must say a huge thank you to all our readers over the past two years. We've had over 250,000 unique visitors to the blog, and over 1,300 posts! If it weren't for you guys all this would be for nothing, so thank you! We're looking forward to another two years - and more! Now as for the Diamondback contest business, we had a great number of contest entries, but there can be only one winner! 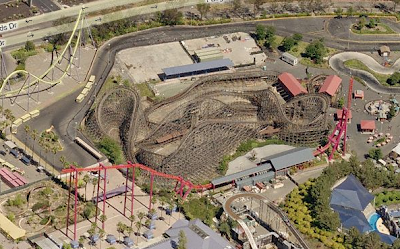 Our question was how many track sections are there in Diamondback - and the answer is 141 sections! That said, congratulations to Chris S. of Ohio who is our winner! Their guess was 143 track pieces. We look forward to meeting our winner at the media day, and as always you can expect a full report! Thanks to everyone who entered! 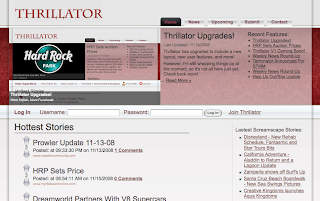 For those of you who are ever ready to expand your bookmark collection I present to you a new site to check out: Thrillator. The site is "a basic web 2.0 user-driven news aggregation site, similar to sites such as Digg and Reddit, but aimed specifically at the online amusement park fan community." NewsPlusNotes's feed is featured on Thrillator, as well. 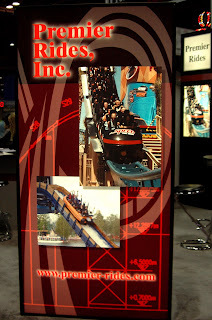 It's a great way to keep up to the second with many of the popular Amusement Industry sites. 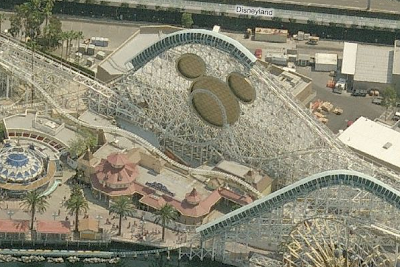 One of our readers recently pointed out to me that the California theme parks have had their images updated on the Live Local Maps. Being the Live Local freak I am, this was very exciting to hear! Smash, that one bites the dust. Next time this image is updated we should get a nice shot of Terminator Salvation! 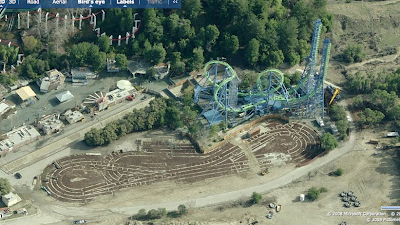 Here's the link to Six Flags Magic Mountain. 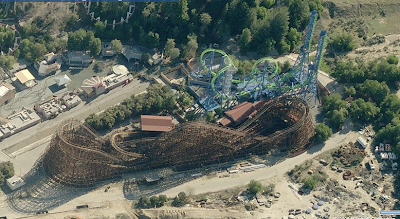 Knott's Berry Farm's images now include the mostly finished at that point Pony Express, but you can also now see Sierra Sidewinder as well. Disneyland and Disney's California Adventure were also updated, you can see that the Paradise Pier section of DCA has the totally finished Toy Story Midway Mania ride now. 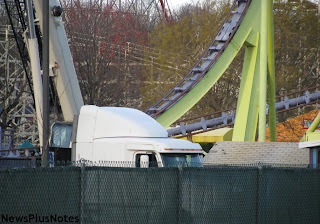 It's neat to see how they stuck the ride building behind the Screamin' coaster, as well as underneath it. 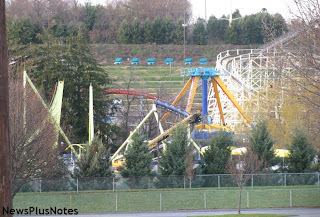 Six Flags Discovery Kingdom was updated as well, you can see that Zonga is removed in the above photo, and V2 has it's fancy new paint job. Elsewhere you can see the Thomas Town as well. 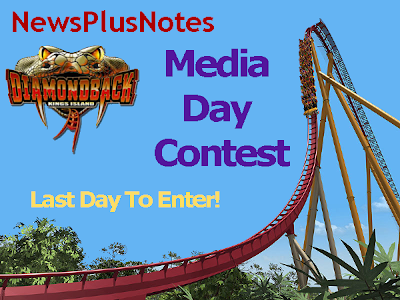 Saturday the 22nd is the last day to enter the NewsPlusNotes Diamondback Media Day Contest! Many of entries have already been submitted, so make sure to get yours in too! Contest now closed. Winner to be announced Monday! Hurry though, the contest ends tomorrow at 11:59 pm and the winner will be announced Monday! Not much, eh? 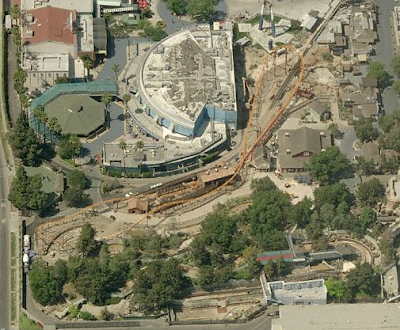 Looks like about 1/4 of the 2nd loop and bits and pieces of the first helix are all that are still standing. A wider view, the skyline at Dorney has once again changed, but this time something is gone, not added. Track pieces are being loaded onto trucks as soon as they are taken down. Close up of the bits that are still there. I'd look for the ride to be totally down in a couple days! 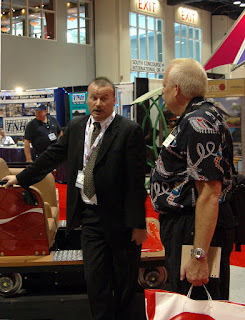 When Jim Seay , President of Premier Rides, hears people say that rides and attractions aren’t rocket science he laughs, because as a project engineer for Hughes Aircraft he is one of few able to make a valid comparison. 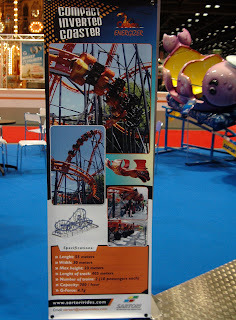 Constant expansion of the amusement ride envelope is the hallmark of company. 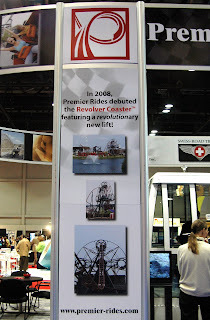 A recent breakthrough is the revolver coaster which opened at Hard Rock Park. 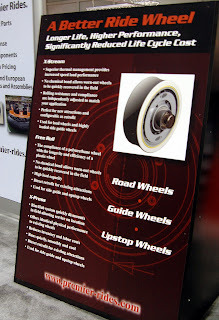 Some other areas include maintenance and technology improvements by offering new types of chains and wheels for existing rides. 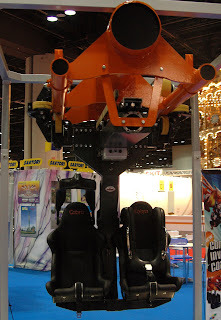 But their real news is the introduction of their compact inverted coaster called Cobra. With a small footprint of 100 feet wide and nearly 200 feet long, it’s hard to imagine that this coaster actually has an inversion. And at one point it pulls over 4.5 gs. The fact that it is built on a platform means there are many options for installation. We need one of these in the US for us to go and check out. 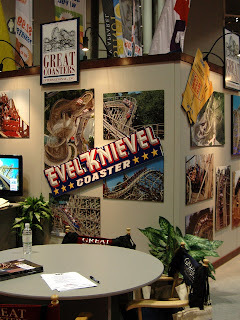 Great Coasters International's 2008 Installation, Evil Knievel was the star of this year's booth, wonder which of their woodies will have that honor in 2009? GCII' is going to be piling up airline miles before next year is done. 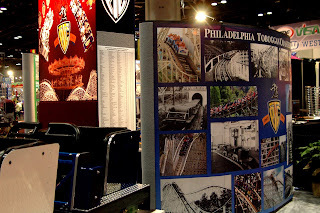 Being based near the east coast and building coasters in Missouri, California, and Germany, they will be road warriors for the winter of 2008. 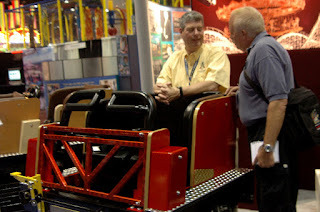 It appears that some travelling plans need to be made for wood coaster fans next year. 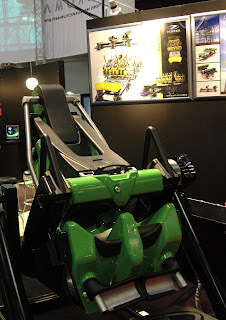 Philadelphia Toboggan Company was showing one of the cars for the new coaster in China being designed by Gravity Group. Here also is a shot of the one bench car and the open front modification available for their current and past trains. 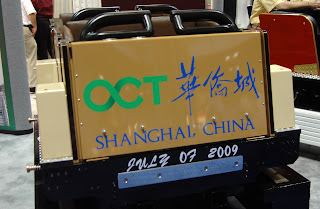 This is just one more option for customers in the competitive wooden coaster rolling stock market. 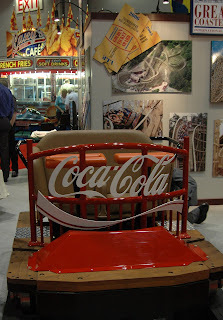 If you would like to have a coaster built in your back yard you should contact Amusement Rides by Bailey. 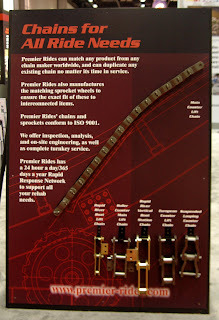 They will design, fabricate, and install a steel coaster for only $350.00 a linear foot. 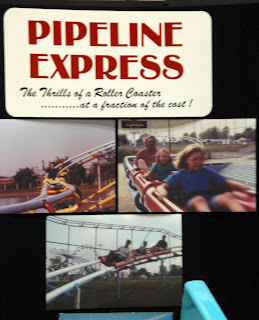 Here is a photo of their first coaster built in Peterborough, ON. When you look at the condition of the track you can see how well designed their products are because this neglected ride is still in operation. 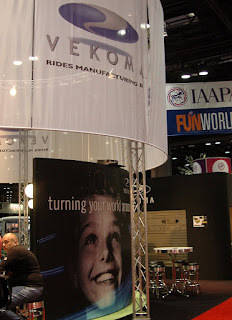 Vekoma has projects for next year on every continent except Antarctica. A lot of excitement surrounds their second generation Flying Dutchmen coach. A more comfortable train and a new reclining feature that uses an electric motor instead of hydraulics should ensure more consistent reliability for future customers. The new Stingray layout features a vertical chain lift and is only one third the size of the original Flying Dutchman. 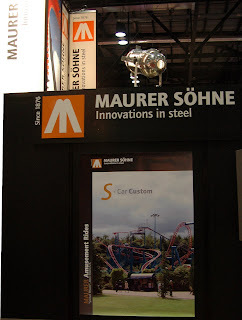 Maurer Sohne is hanging their hat on the new coaster for Universal Escape in Florida. Due to limitations from the customer, no photos of the ride layout were permitted but it looks to be a positively special roller coaster. Hopefully the veil will be lifted soon on this upcoming attraction. 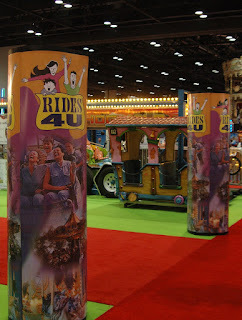 Rides 4U sells both new and used rides. 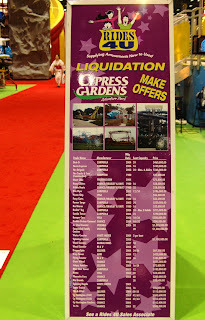 We mentioned them because they have listed all the rides from Cypress Gardens. They even said two of the rides are already sold, but not the wooden roller coasters at this time. Well, there’s still hope for tomorrow. So, here's the show floor. All 8.3 miles of entertainment. 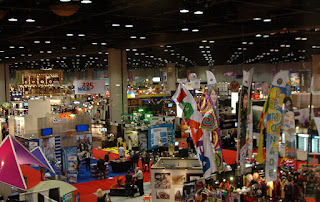 When you look out through these overhead windows at the show floor, almost everyone in the room supports GKTW through gifts-in-kind, monetary, or supporting the various fundraisers. 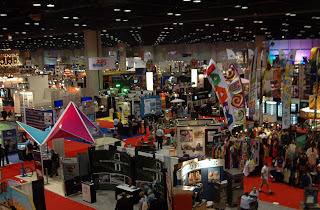 So that is the last of our onsite reports for IAAPA EXPO 08. We hope you enjoyed them.